Yes, a lot of dogs just love to chew, maul, rip and mangle their beds. Whilst it might be fun for them, it isn't for our patience and wallets! Indestructible dog beds can put a stop to your dog's annoying habit. Luckily there's some really tough dog beds and durable dog beds out there that will survive all sorts of treatment. These indestructible dog beds nowadays can be just as comfortable as regular dog beds. What are indestructible dog beds? Many dog beds have zips or fastenings which attract your dog's chewing tendencies. They may also have thin material which is easy to scratch through. Indestructible dog beds don't normally have either obvious fastenings or flimsy materials. They are normally made with a rip-proof outer material and a hard-wearing inner filling. Well perhaps not. If they feel like it, dogs may just keep on trying to destroy their bed. But bear in mind that some dog beds may only last a few days or weeks! Indestructible dog beds can last years - so in the grand scheme of things, yes, that's pretty indestructible! Some manufacturers of indestructible dog beds will even promise a lifetime guarantee with the bed - that's a sure sign they will live up to their name! For dog owners who like their dog to be raised when they are snoozing, there are 'metal-framed' dog beds available. The frame is covered by a tight heard wearing material upon which you can place a mattress or blanket. As the frame is metal (rather than plastic or wood), dogs aren't going to bother to chew them. Investing in an indestructible dog bed can be a very worthwhile exercise! 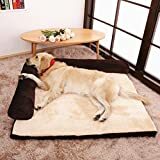 The money you will save on replacement dog beds will be great, and so too will the saved efforts of cleaning up bits of bedding every few days or weeks...! We give indestructible dog beds the thumbs (or paws) up! A really useful way to save some time, money and quite a lot of stress!